SETUP & TRAINING - We will setup your accounting system and train you or your personnel to ensure accurate and timely accounting activity. We can remain available for on-going support. TIMELY AND ACCURATE FINANCIAL REPORTING - After initial setup, we can continue to maintain your books for you. We can do the actual transaction inputting, or you can assign personnel to handle that task. In either case you are provided with accurate and timely financial reporting in accordance with IRS guidelines, and with GAAP if necessary. INTEGRATION WITH YOUR TAX PLANNING - The next step is to integrate your business results with your personal tax position. Working with professional CPA’s (either yours or ours), we can determine the best way to maximize the success of your business as well as your tax position. Establish operating and capital budgets to provide a working “game plan” for your business. Provide tools to analyze the effectiveness of your operations. Assist in ensuring all applicable regulatory and legal filings are made timely and accurately. Establish systems to provide real-time key information to provide for improved decision-making. Set up payroll in compliance with regulatory and tax requirements. Are Your Business Accounting Needs Being Met? There are many important aspects in running your business; looking for new opportunities, negotiating the deal, finding suppliers, keeping your employees productive. With all of this it is often difficult to find the time to ensure that your accounting and transaction processing needs are also addressed. How can you bring focus to these accounting details without losing your overall vision and purpose? The Concept is simple. You, determine exactly what you want to pay to support the accounting aspects of your business. We then put together a plan to make it work for you. This is obviously a crucial question. Experience has taught us that the average business will spend between 1-5% of yearly revenues on the Accounting function. Of course this varies by size and the complexity of the business. To see where you may fall within this range click here. Is your current accounting system giving you what you need? And if it is are your processes setup cost-effectively to produce timely and accurate data. Are your people trained properly to get the most out of the system? If you are thinking of installing a new small business software and want to discuss the options; or, if you like your current system but want to get more out of it, then give us a call. We can assist in both needs evaluation and solutions, as well as process analysis/improvement and training. 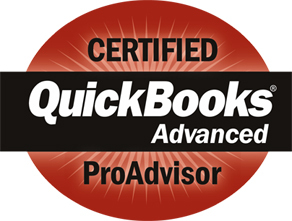 We specialize in QuickBooks, so if that's one of your possibilities we're the ones to call. However, we also are familiar with a variety of other potential platforms, and can help lead you through the decision-making process. click here to see more on what type of accounting software for small businesses is available. Financial Reporting & Analysis - One-time or On-going. Let us take a look at your financial reporting mechanisms. Are you getting the numbers you need on a timely basis? Do you know your cash position, inventory, AR, AP, when you need to? Are you doing monthly variance analysis to see crucial trends? Do you have a budget and are you comparing actual results to it. Is there a cash flow forecast so that you can be sure you'll have funds available when needed. For as little as $250 OnTrack Accounting can provide a detailed analysis of where you stand with your financial reporting timeliness and accuracy, and what you need to get to where you want to be. They teach you in MBA school about the crucial need for any business to setup a workable budget - to see where you've been - and forecast - to see where you are going; yet many small businesses have neither the time nor experience in how to go about this. We can take the pain out, and guide you through the process of establishing and using effective budgeting and forecasting. If your not looking at both the income and cost sides of your business on a monthly basis, and.or not looking ahead to see where you are going to be in two to six months, then call OnTrack Accounting and let us help. We can establish these processes for as little as $500, then you can run things from there, or we can stick around to help. Medium to small-size businesses run lean and mean - in today's environment this must be a given. Typically it is not easy or cheap to add personnel to help get your accounting caught up for year-end and tax filings. But don't just let this go until it's either too late or too painful. Call OnTrack Accounting to help fill the gap. We can come in and provide very cost-effective help and experience to ensure that your books can be accurately closed for the year, and the appropriate data provided to your CPA. And, if you need an CPA, or a new CPA, we can help you there also. There are two key elements to maintaining accurate and useful accounting and financial records; people, and the systems they use. Are you getting the most out of your accounting system? Is it easy to work in? Are you finding you are having to do data entry more than once? Are you getting the reports you need in a timely AND accurate fashion? If your experiencing dismay with your system, with it being either too slow and time-consuming, or unreliable, please don't hesitate to call. OnTrack Accounting can conduct of straightforward review of what you have, compared to what you need and want, and provide you will either suggestions for improving your current system, or analysis and recommendations for moving to an alternative platform. I mentioned the people aspect above. No matter how good the accounting software you use, it will only be as good as the people who use it. Many individuals doing transaction processing for companies are provided with very little training in terms of the concepts and principles of accounting and accounting and financial processes. However, it is surprising how quickly they can be brought up to speed when knowledge, structure and a bit of encouragement is provided. OnTrack Accounting can provide an integrated approach that combines knowledge of your software's capabilities and experience in managing accounting process with a tried and true ability to impart these facilities to your people so as to make them effective custodians of your accounting system. Are you concerned that you are not reporting your sales tax, and/or your payroll taxes, in a timely and accurate manner? Penalties for late or inaccurate filings can be steep. Additionally, attention to detail and correctness is essential here as you are dealing with matters that can involve fairly high levels of complexity, as well as confidentiality (such as varying tax jurisdictions for sales tax, or employee benefits for payroll taxes). Even if your using one of the many payroll services, it can pay to have us take a look to see if your getting value for your money. We can assess your situation in minutes and give you the piece of mind of knowing that these important processes are being handled accurately and cost-effectively. Verifying transactions to documentation, are the numbers supported?